12:30 hr - Arrived Bogalay Township - Flat tire, helped by locals, who shared their experience: received warning in the morning at around 7 on ward by speakers (they know only for the Bogalay town, but not sure about the villages around/across the river, near sea), no evacuation plan, many people didn't pay much attention as they didn't expect much danger based on the past Tsunami experience in Delta (little damage), they started noticing of heavy winds around 6 p.m. and became stronger, the sky were totally red, wind blew from different direction, then many people in town took shelter in neighbors' houses (with brick-wall/strong roofs), debris everywhere, one person said it could have been worse (more casualties) in town if happened during the day time as many people were on the road (20 deaths in Bogalay town - figure not confirmed), water went up to about 3 feet in town and reached up to 20 feet in surrounding villages, where thousands died. 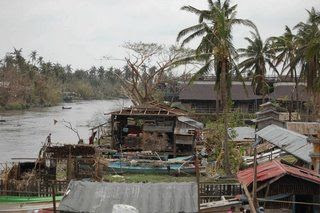 Those who helped us said that they will never forget the experience and they lost their houses (saw in person), but they seemed to have high-spirit waiting for help to rebuild their houses (now they got help from their neighbors for shelter and rice from relief camps). But, under the condition, they shouldn't wait any minutes. Distributed a few bags of milo, ovaltine, some food etc. to them and gave a tent-sheet (bought from BKK) to an elderly who still lived under a house with no roof (experienced some rain). The conditions in surrounded areas of Bogalay are very bad as the authority had to issue Martial Law in some areas (some looting and killing for food). Those who survived (7-8 only in some villages) left their villages. 13:30 hr - Went to the central relief camp (to coordinate/receive donations) and spoke to the authorities (noted their names and phone number). Donated: 8 boxes of Tylenol, 4 Ovaltine bags, 3 Gold Roast, 5 NesVistat, 1 pack (60 WPTablets), 1 ORS box. Asked about the urgent needs. According to them: Nails (all sized), salt, water purifier (available locally: 1 bottle for 220 gallons - need to know the price), lease vehicles, eggs, dry food (Mhote Chaut), dry fish, artificial meat. 14:00 hr - Went to the river bank (similar to Tsumani affected area to some extent - based on what we saw in Phuket area). Talked to some locals: situation is still very chaotic, they saw 4-5 bodies in the river, we saw one, nobody seemed to care about that even we saw some people around and they were trying to save an engine from the river). Saw some victim family/refugees in a monastery, but couldn't talk to them due to time constraint. One thing that surprised me was that we didn't hear anyone crying for help or asking desperately for food/shelter. I'm sure that will be a very different story in a severely affected areas that can be reached by boats. Some aid workers and volunteers have already arranged with some boats to reach there to deliver supplies. Conclusion, based on this experience, it's very feasible to reach to the affected areas in Delta very quickly. Road conditions in some areas are bad, but manageable: with normal speed (40-50 km/h), even Bogalay can be reached within 4-5 hours. Since some bridges are not strong enough, heavy supplies (such as rice) wouldn't be practical. There were some normal checkpoints (asked questions: where to go? driver's name?) One must avoid any argument with the authorities at the checkpoints as it might just delay achieving your main objectives. I have discussed with different group of volunteers (TZ, KM, SM, HM, AM confirmed) and will coordinate with them from here or in-person for distributions and local supplies. The full assessment report, pictures and plan will be posted soon.